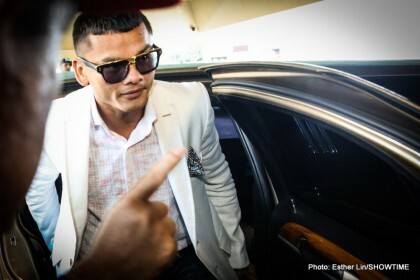 A couple of days ago, a photo of Argentine warrior Marcos Maidana surfaced on the internet and it caused quite a response, being re-posted a number of times. Maidana looks very much over his fighting weight in the pic, his stomach bloated and rings of fat evident. Immediately after seeing the picture, fans everywhere came to the seemingly obvious conclusion: the once great action fighter who gave us memorable fights with the likes of Victor Ortiz, Amir Khan, Adrien Broner and, most recently, Floyd Mayweather Junior twice will not be fighting again. Maidana of course does not have to fight again, he has earned his money, his reputation as a true warrior and, perhaps most importantly to him, the right to get fat, party and basically enjoy his hard-earned money. One man who isn’t surprised Maidana has piled on the weight and is relaxing, is his former trainer Robert Garcia. Looking at the snap of his former charge – who looks to be anywhere from 40 to 50-pounds above the welterweight limit – Garcia, as he told RingTV.com, said he knew Maidana did not want to fight again. Maidana twice hit the so-called “Mayweather lottery,” and he is obviously financially secure now. Maidana, who had it tough as a youngster, fought with venomous hunger and desire in his prime years. Now, he is entitled to sit back and enjoy himself. Why should we be surprised he’s piled on the weight? Maidana is neither the first fighter to balloon some in retirement (see greats like Roberto Duran, Jake La Motta and even Muhammad Ali back in the 1980s) nor will he be the last. Still, despite his current bulk, Maidana, a true fighting man, would be more than capable of sorting out any of the keyboard warriors who enjoyed themselves mocking “El Chino‘s” appearance in THAT photo!